Bossing myself is a lot of responsibility. I can't even handle it sometimes. Really! it's too much.. Now, Joel is coming home it means that I have to boss him around too.. Oh man!! Well, I guess I don't have too. No I don't, I'm a good girl I am. It's amazing though that there are people who wants to be in control of everything and everyone. I wonder, maybe those people doesn't like themselves so much that is why they want someone else's life to control. Pity.. I pity those people who are control freak. Life too short to be miserable. 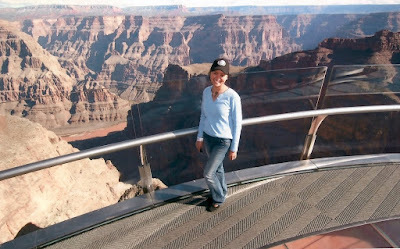 this picture was taken from the Grand Canyon Skywalk last year. It was our 9th year wedding anniversary trip.